This time of year is always super busy for us with fun events most weekends, and this past weekend was no different. 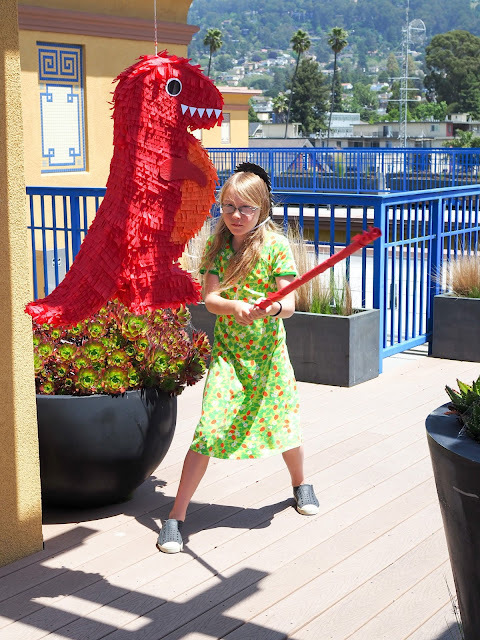 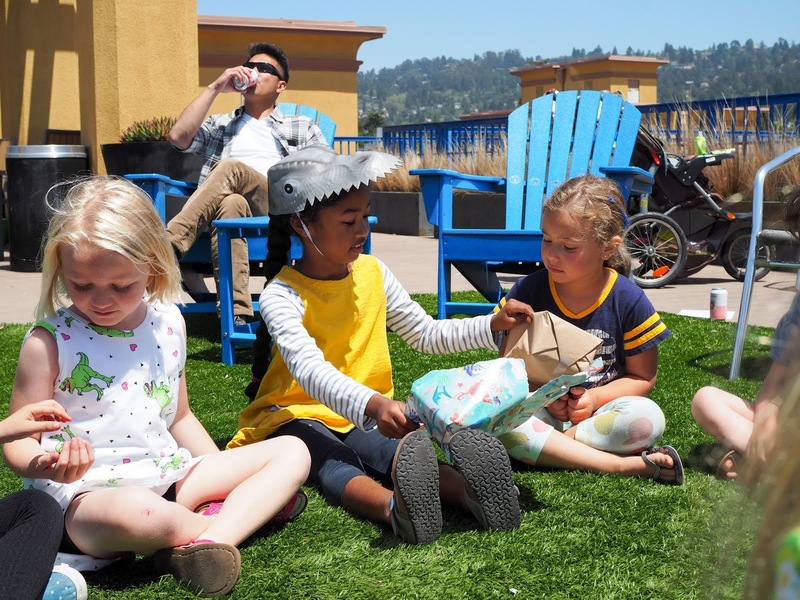 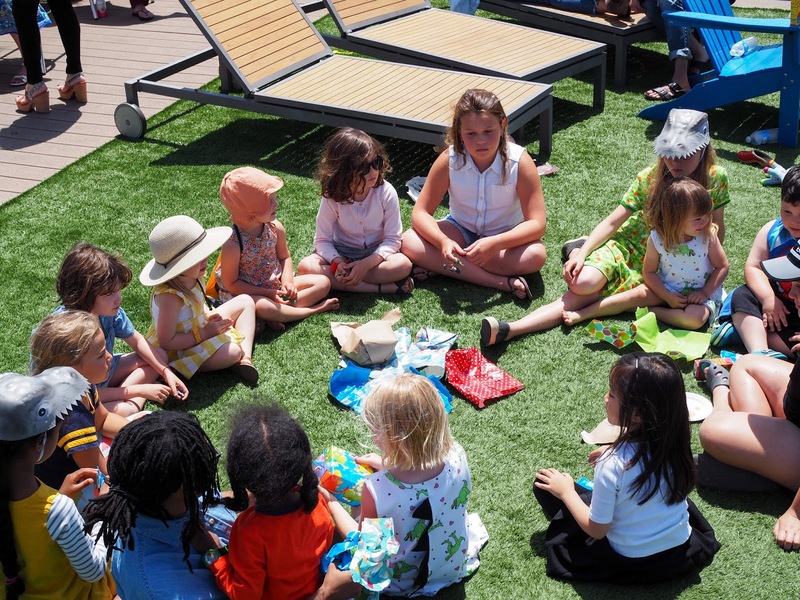 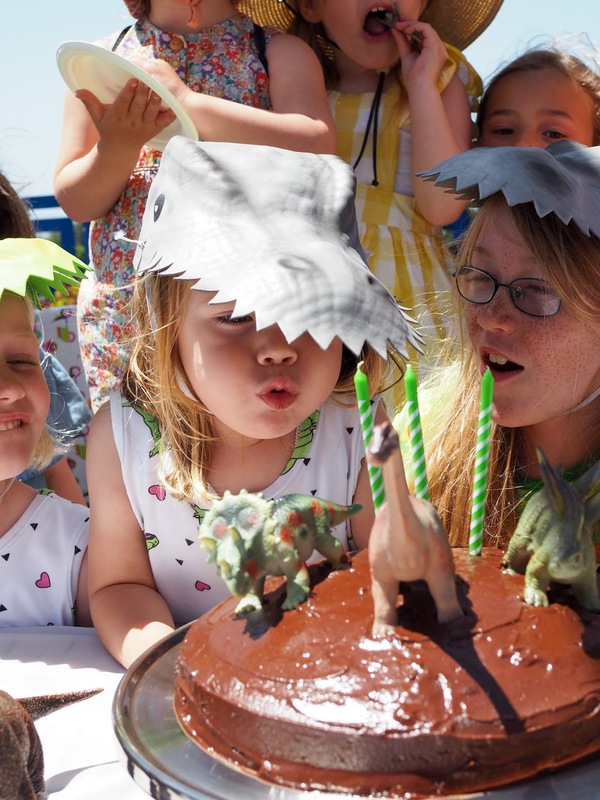 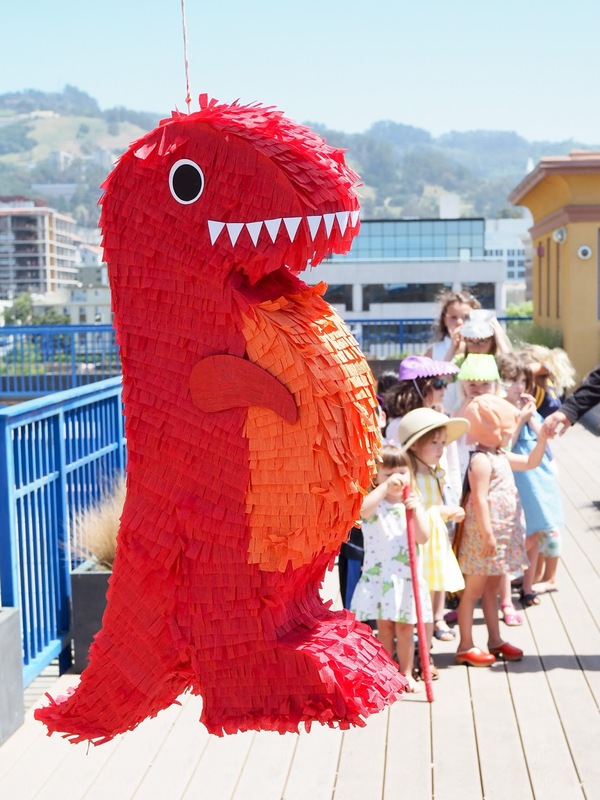 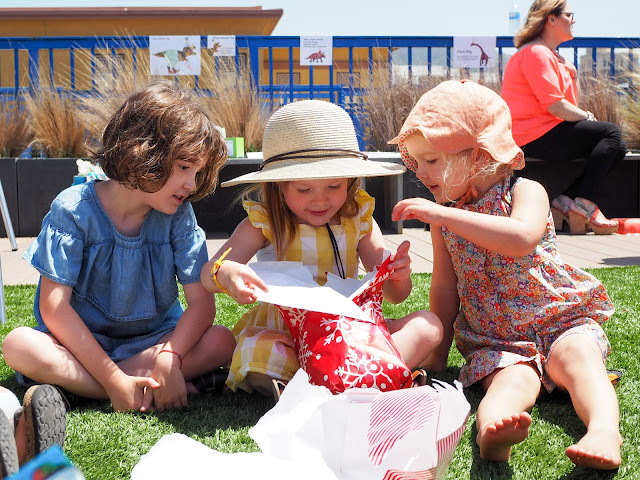 In fact, this past weekend saw one of the most fun events for us: Mathilde's dinosaur party! 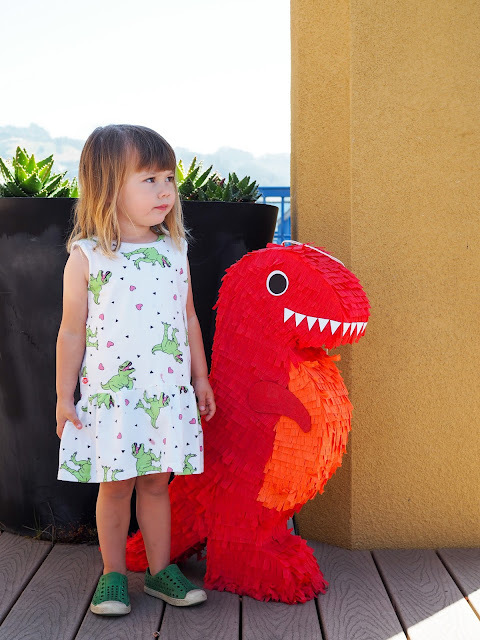 Mathilde had such a fun time celebrating her 3rd birthday with all of her little (and big) friends. 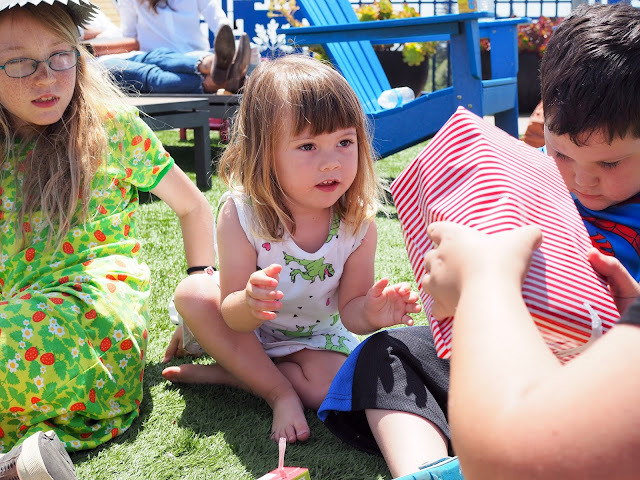 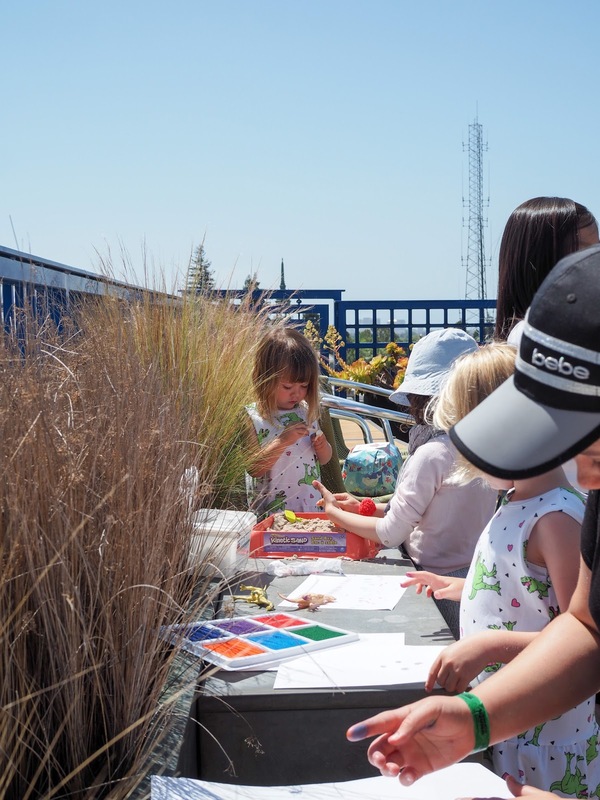 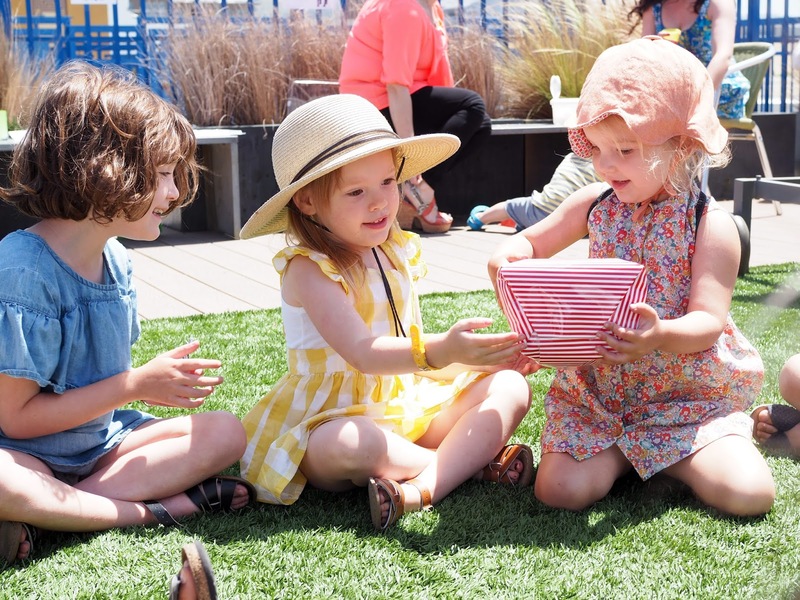 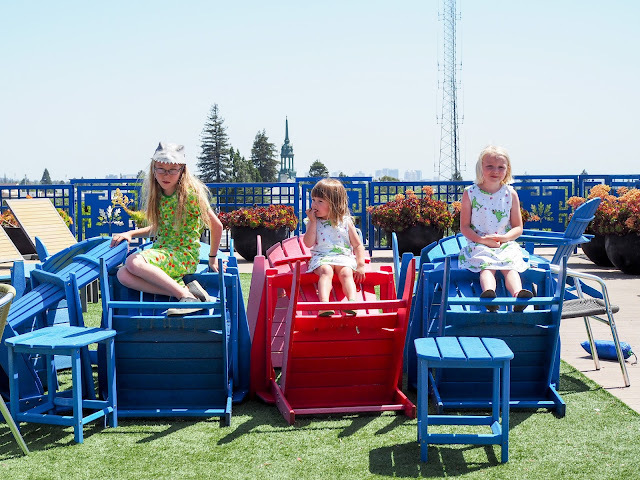 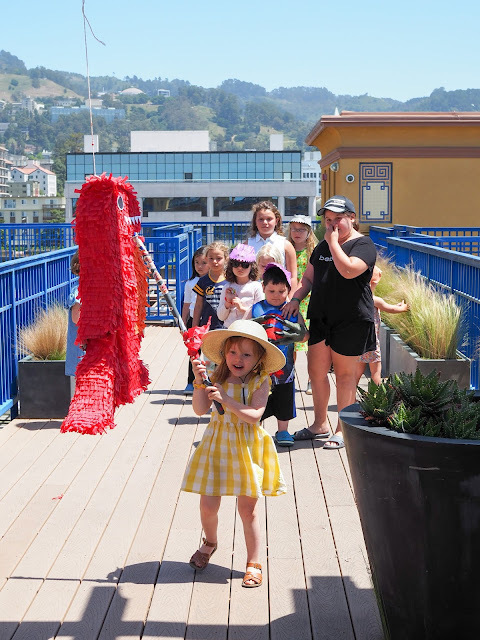 We were lucky that Sunday was an absolutely beautiful day weather-wise and this year, there were no other parties up on our roof deck at the same time. 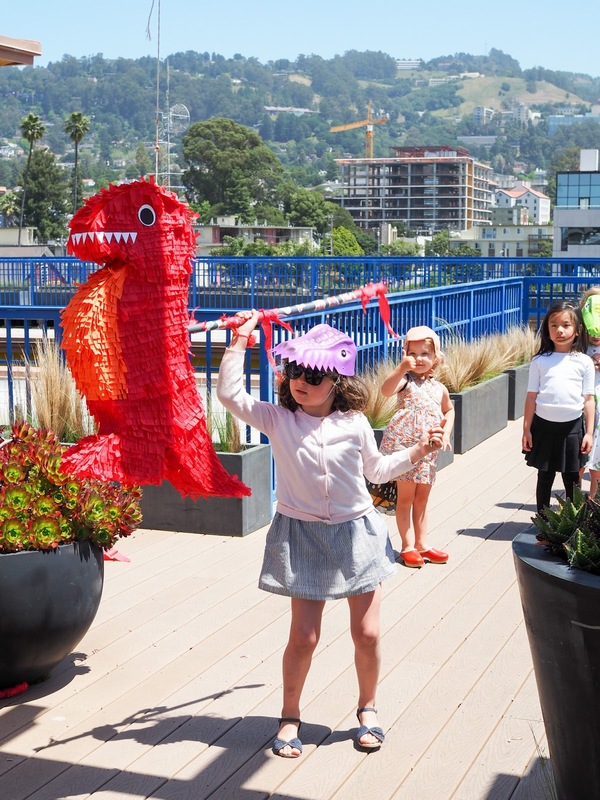 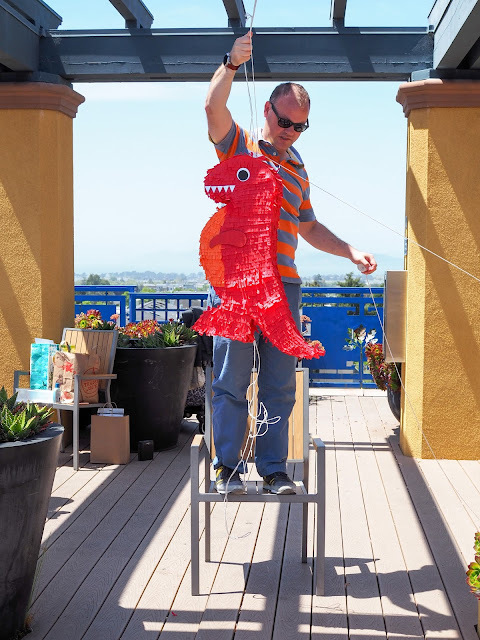 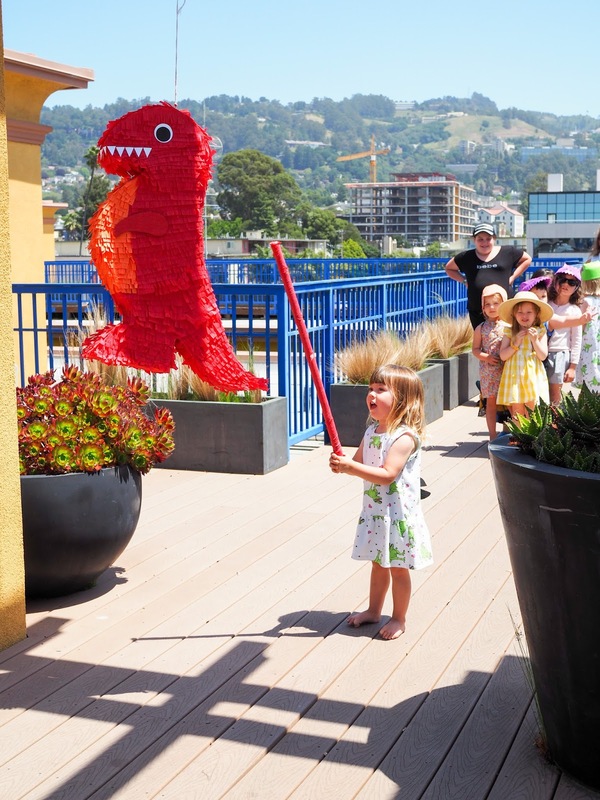 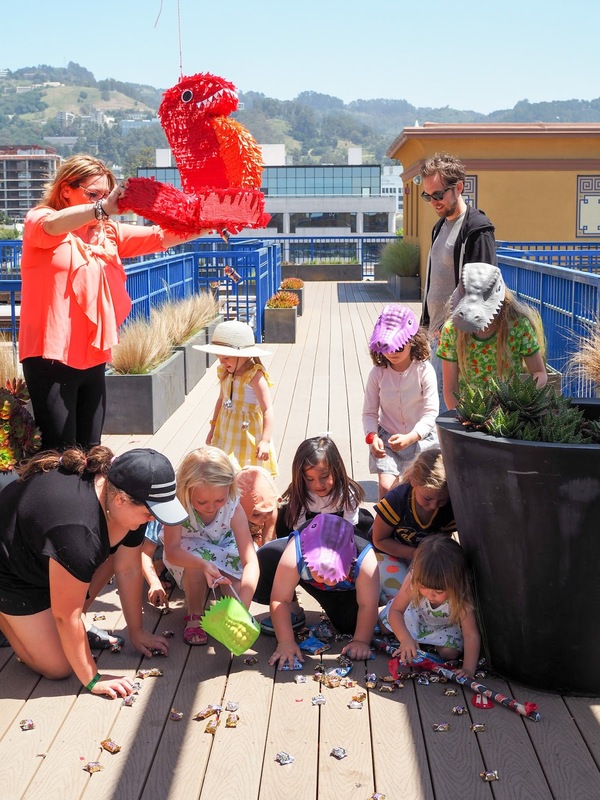 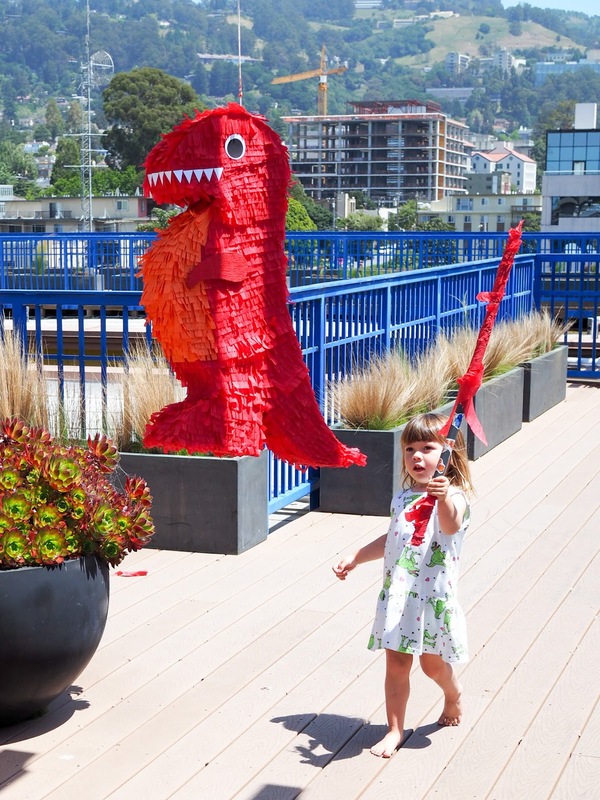 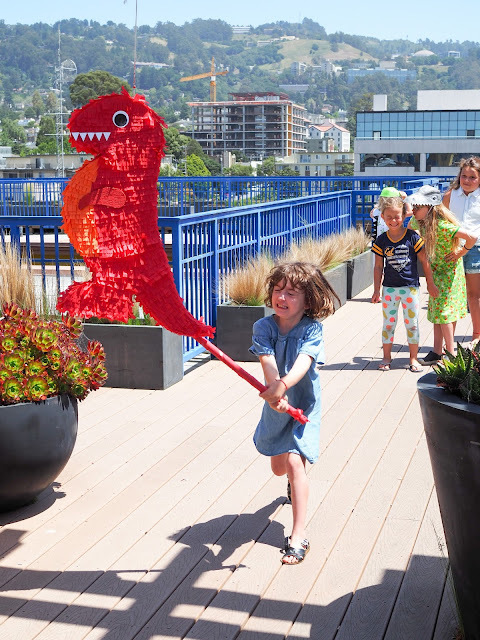 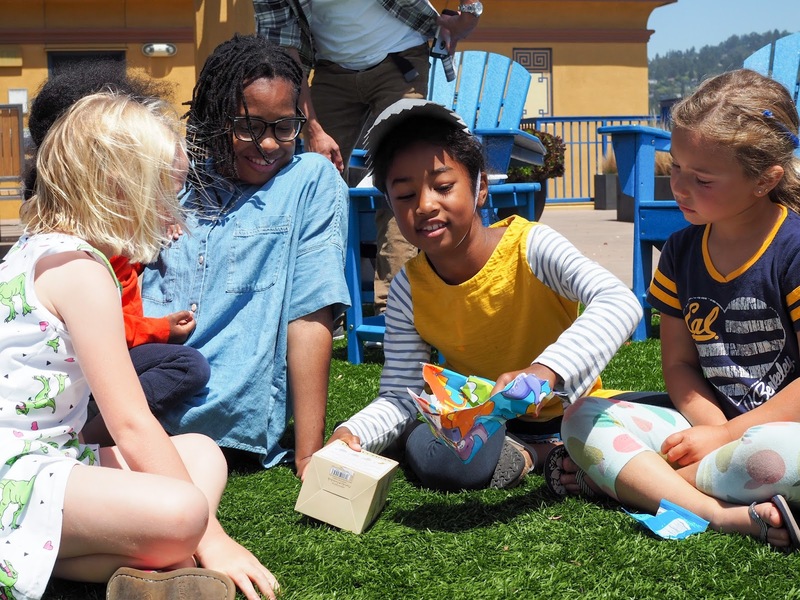 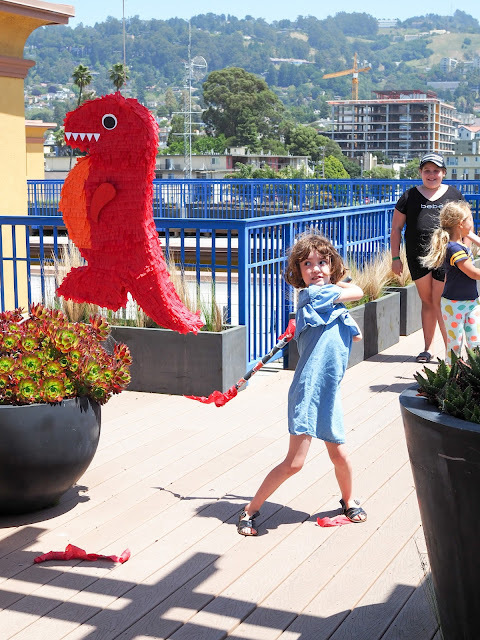 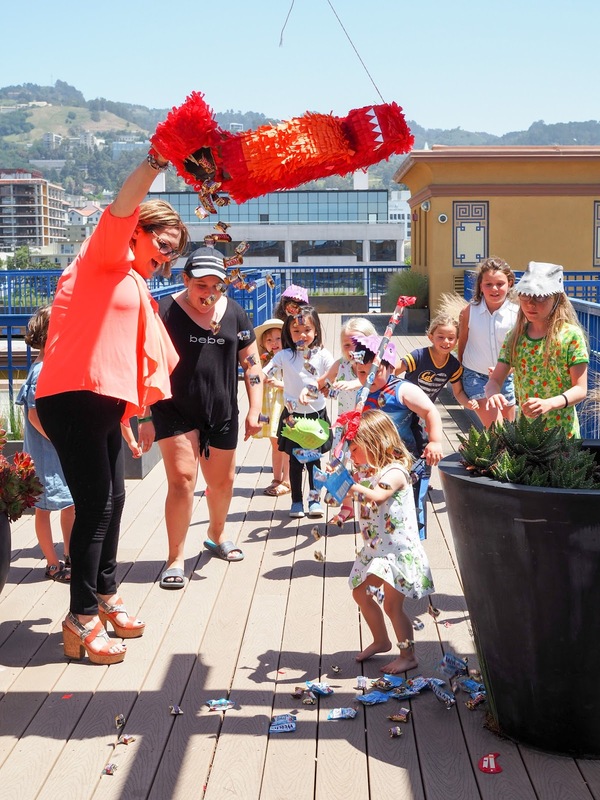 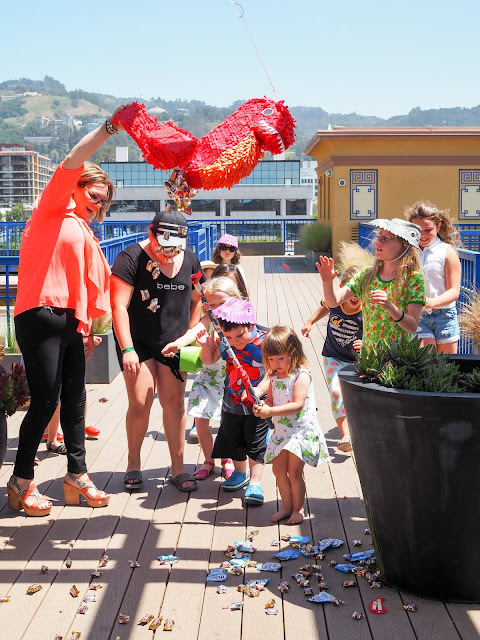 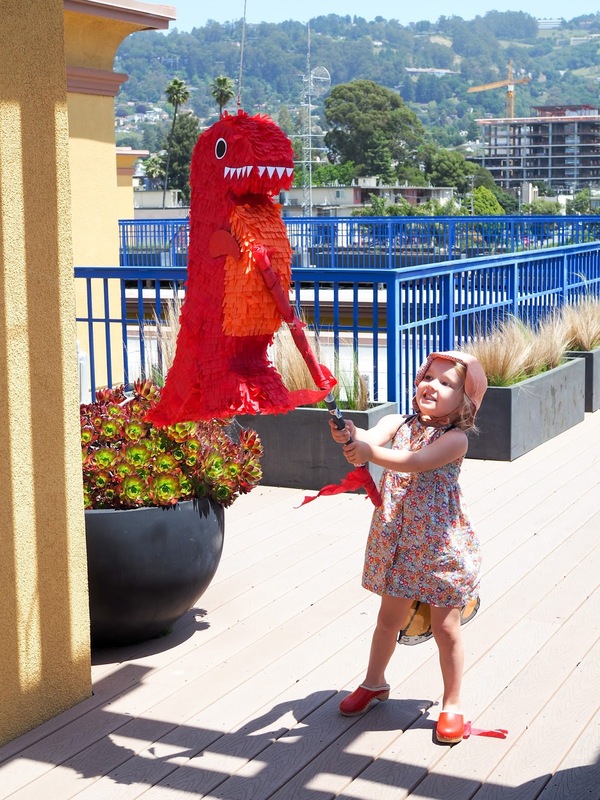 Last year there were other tenants using the pergola area on our roof deck during Mathilde's digger party so were not able to use the table and chairs, and we had nowhere to hang a piñata. But this year we were in luck and had the whole roof deck to ourselves. 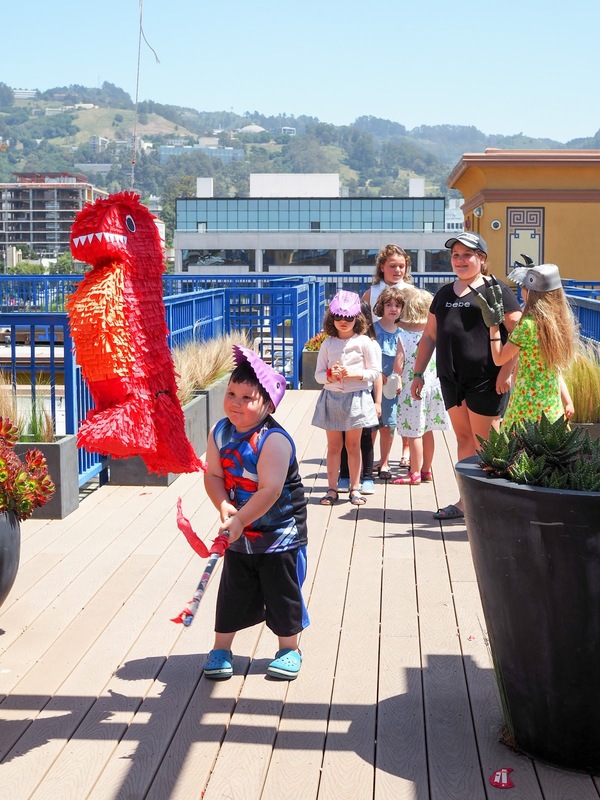 Or maybe all of the dinosaur roars coming from the kids scared everyone else away! 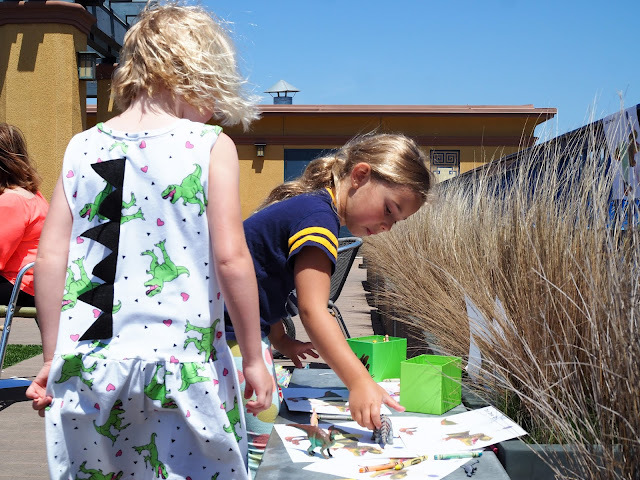 Now, it wouldn't be a dinosaur party without lots of fun dinosaur themed activities to keep the kids busy, so I set up a few different activity stations. 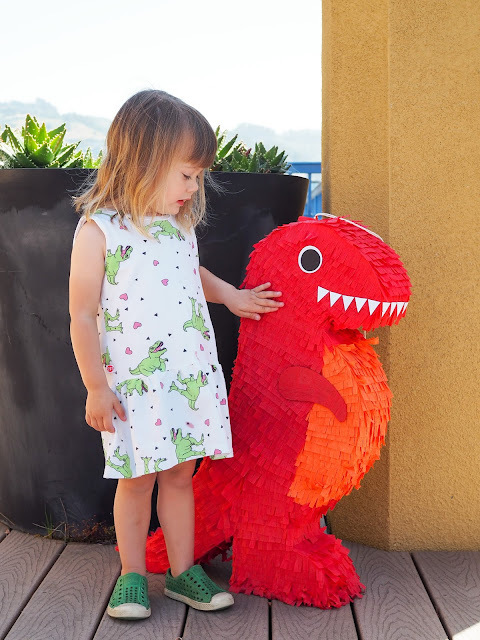 These were a hit with the kids. 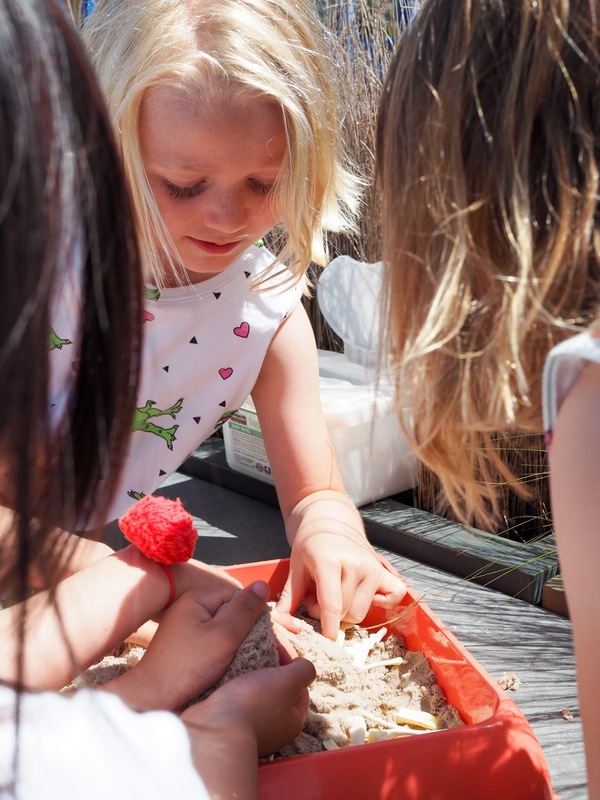 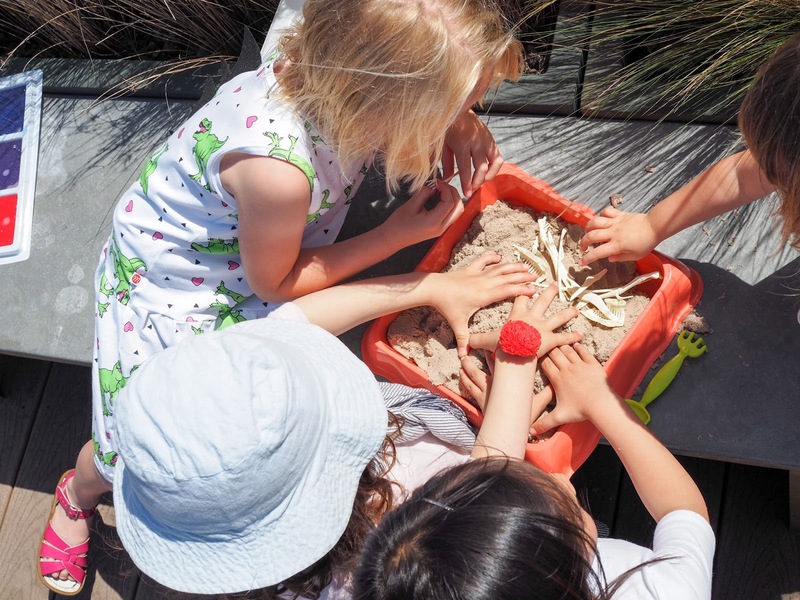 We had a dinosaur bone dig with pteranodon bones buried in kinetic sand (the most fun sand ever! ), a dinosaur dress up with stick on clothes and accessories that the kids colored then stuck on a t-rex picture, and an ink pad set up for making dinosaur footprints. 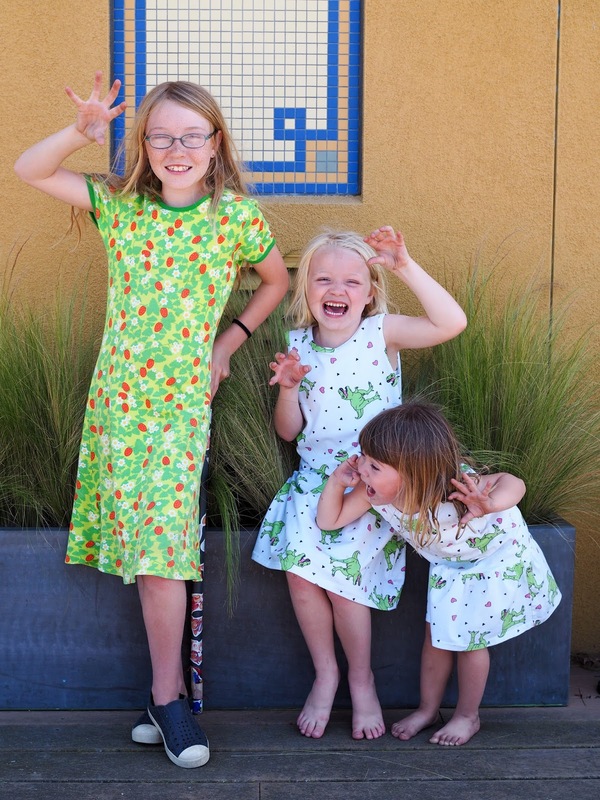 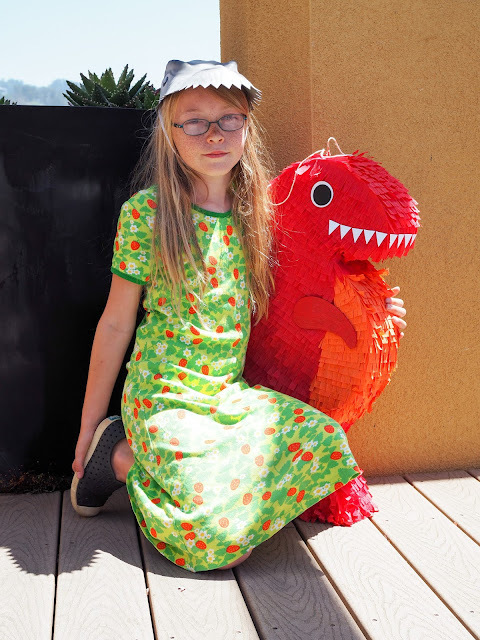 I'll have a separate post about the dino dress up coming soon as well as printable templates. As we always do at parties, we played Pass the Parcel. 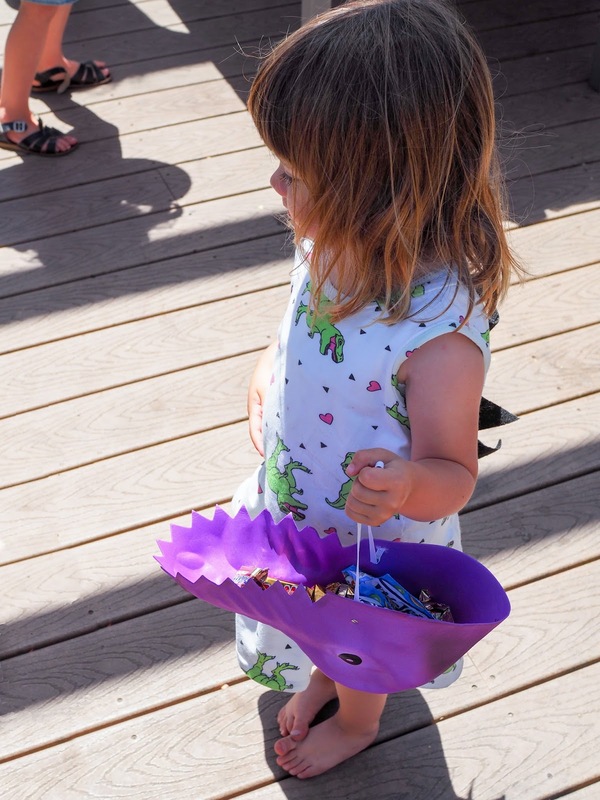 I included small prizes along the way such as small plastic dinosaurs and fruit gummies, and the prize in the middle was a dinosaur egg. 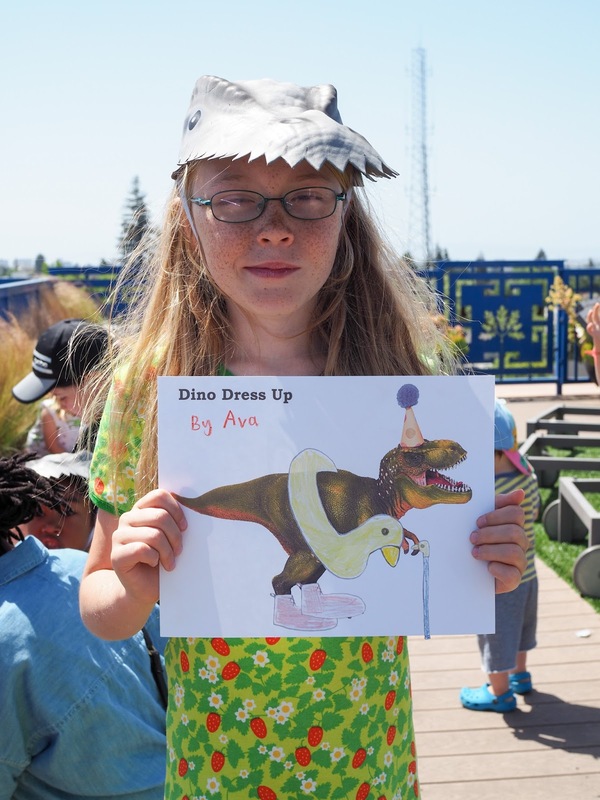 Well, not a real dinosaur egg, of course, but rather the kind that you dig at to reveal a toy dinosaur inside. 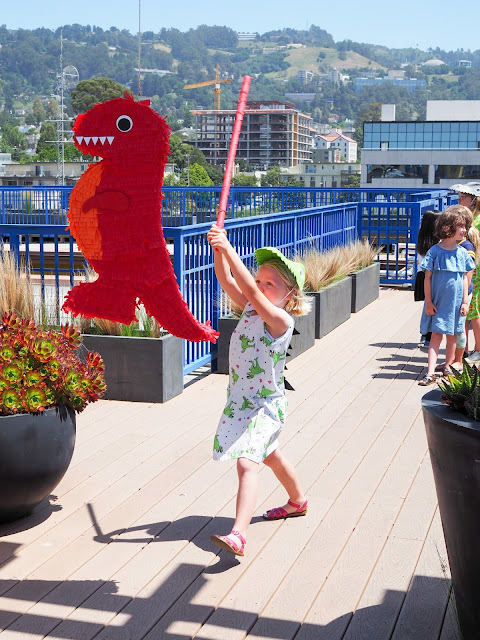 Anyway, we hung up that "fluffy like a puppy" t-rex and the kids had a go at smashing it open. It turns out I made it a little too strong as the kids struggled to cracked it open even after quite a few turns each. 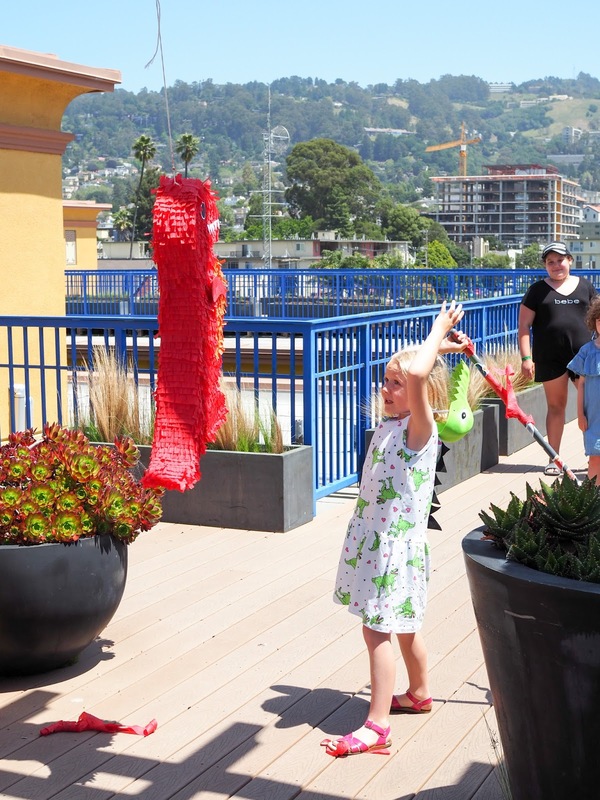 The adults had to step in and help before letting the little kids finish it. 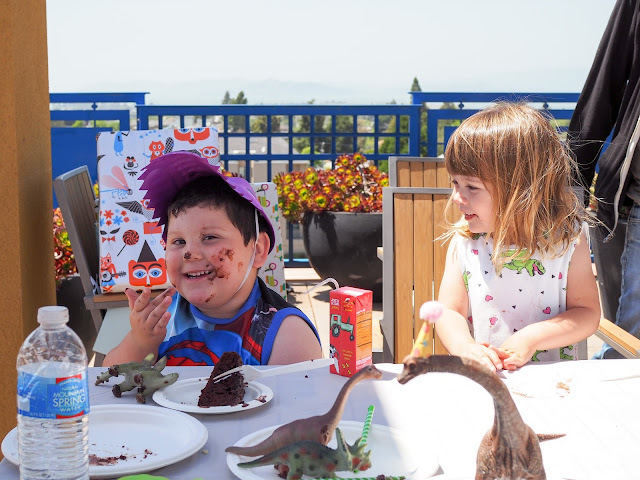 Then it was time for birthday cake. As always, it was too windy on our roof deck to successfully light the candles so we just had to pretend. 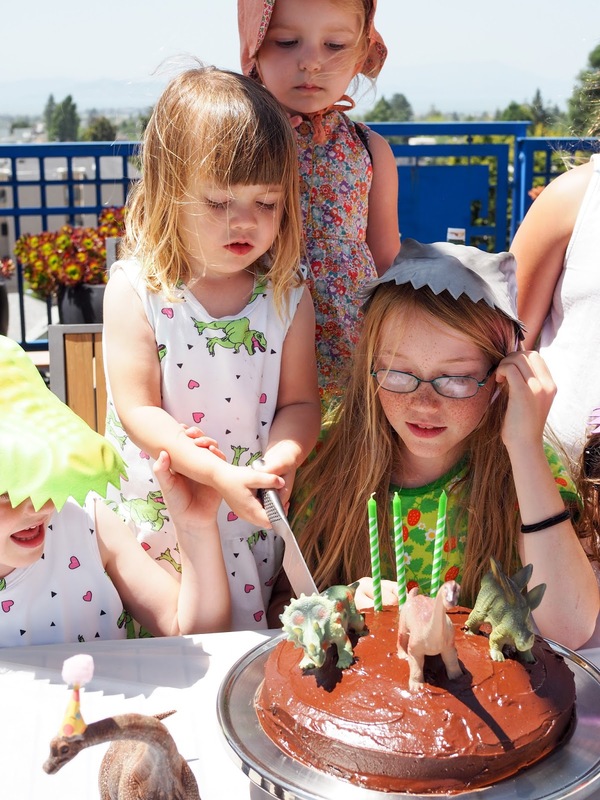 Mathilde still leaned in to blow the candles out at the end of Happy Birthday! 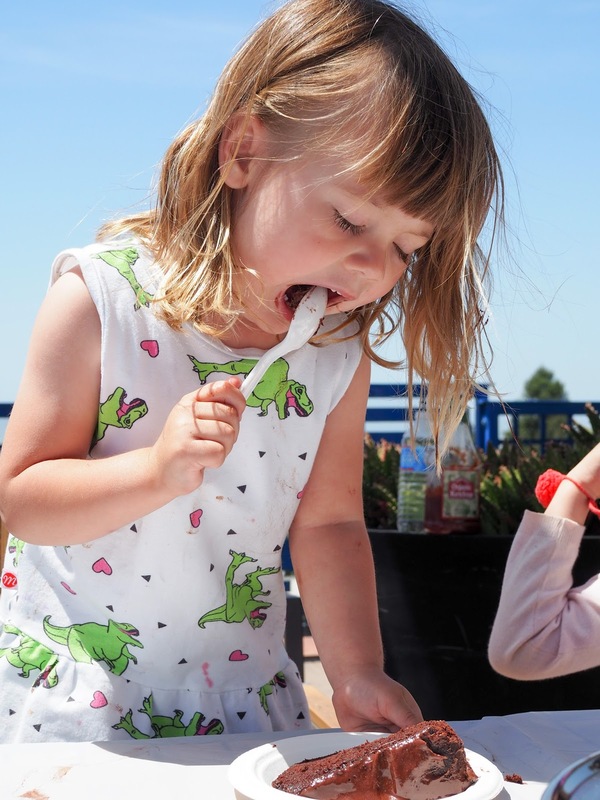 The cake (a packet mix from Miss Jones) was delicious even if the frosting had started to melt a little sitting in the sun! That melted frosting made for fun dinosaur footprints though as Mathilde's friend Gabe discovered! 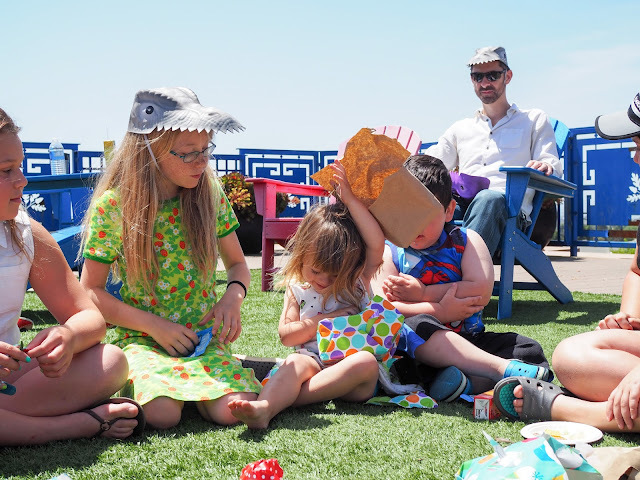 Once the kids had finished their cake the party was pretty much over and the kids decided it was time to do what they always do up on the roof: make a fort out of the furniture! 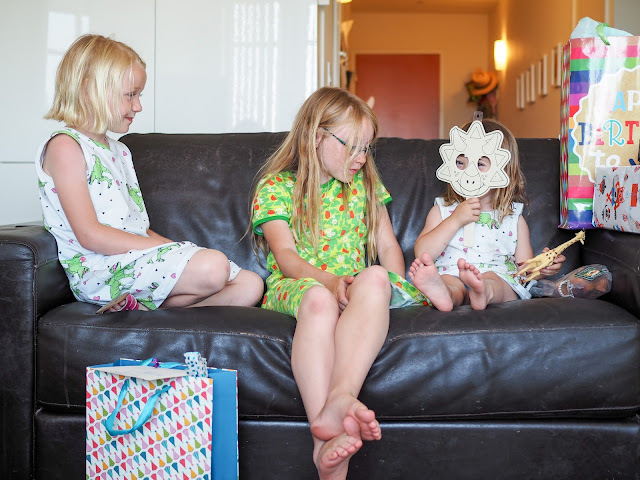 After we said good bye to our guests and packed everything up Mathilde opened her presents. 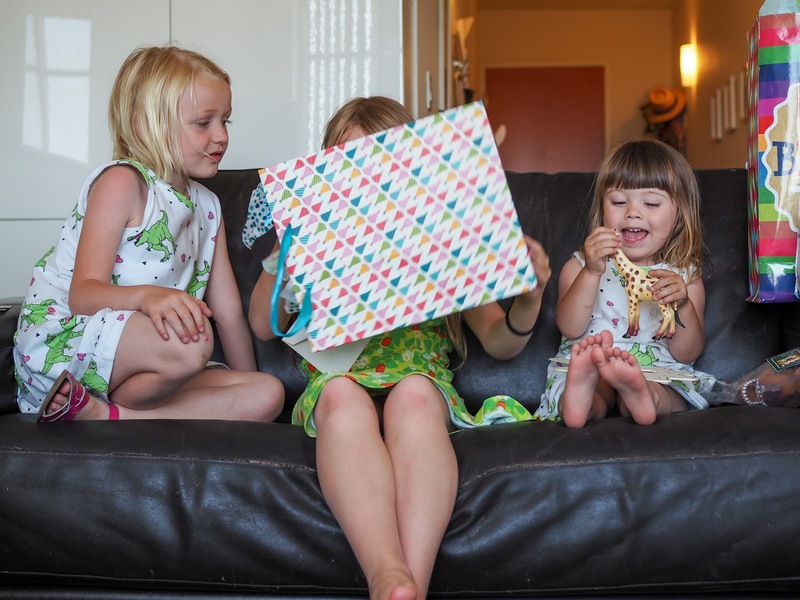 She was totally spoiled by her friends and loved all of her presents. Thanks to everyone who helped celebrate Mathilde's birthday with us. It was such a great day. 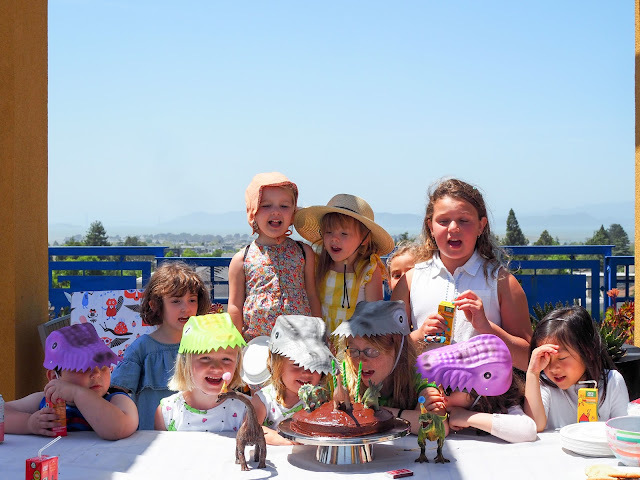 I have a few dinosaur party DIY posts coming soon so stay tuned!